When you look at your face in the mirror do you see smooth clear skin or a network of disfiguring broken veins and burst capillaries? If the latter, you’ll be pleased to know that the magic of modern technology can help you. Thread veins or spider veins are minute blood vessels located close to the surface of your face. Also known as ‘broken veins’, they appear as fine red or purple squiggly lines. Facial veins can build up on the nose, cheeks and chin and mar the smoothness of your face. Often their appearance has no one specific cause. It’s just part of getting older and associated with the loss of elasticity in our skin and supporting and connecting tissues. Women seem more likely to develop them than men due to the effects of hormones, especially during pregnancy and the menopause. They can also be hereditary. Sometimes they appear as part of rosacea. In such cases, you may also need medication to treat the condition. So how do you get rid of facial veins? The key first step, as in all our treatments, is for our doctor to assess the condition of your skin. In order to develop a facial vein removal treatment, she has to determine matters such as skin type. Then she can recommend appropriate treatment along with its estimated cost. Some clinics use “Intense Pulsed Light” or IPL to treat facial veins. IPL, being a “scatter gun” of many wavelengths of light is a risky approach to treating facial veins. Here at Nitai Medical & Cosmetic Centre we use the safer and more efficient Medical Grade Gemini laser machine. Facial vein laser therapy uses the precise power of laser pulses to destroy these small blood vessels. As they’re close to the skin, the process is safe (with well understood risk profile) and non invasive. Red veins near the surface can be treated by a pulsed dye laser. Those deeper down which tend to be coloured blue or purple required the use of a NdYG laser to penetrate deeper. Vascular lasers product a light beam that’s well absorbed by blood. This enables your skin doctor to treat your broken blood vessels with extreme precision. The “Gemini” is a non-ablative laser designed to penetrate into the lower layers of the skin without injuring the outer layers. A topical anesthetic will be applied prior to treatment to reduce discomfort during the procedure. Multiple treatments may be necessary to achieve complete satisfaction. The following patient was treated for burst capillaries by Dr Singh using Gemini Laser. The patient received multiple treatments. These photos were taken 2 weeks after the first treatment. In any event, laser treatment for facial veins needs to be tailored for each individual. So if you want to say goodbye to these unsightly blemishes get in touch today. 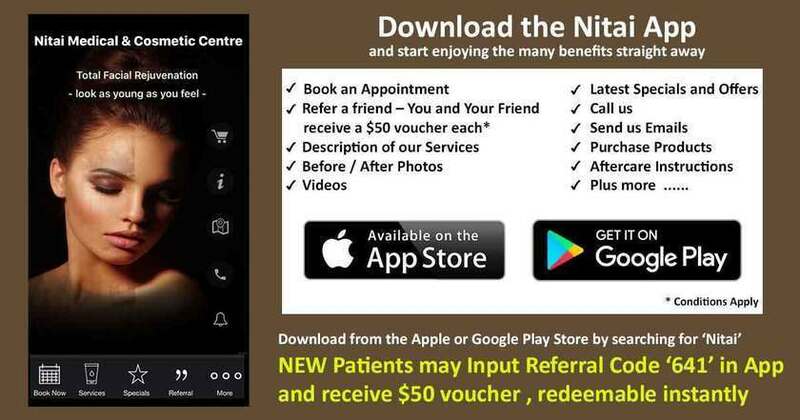 If you want to deal with your facial veins quickly and effectively, call Nitai Medical & Cosmetic Centre on (03) 9300 1244 to arrange a no obligation consultation. To receive more specific advice and costs , we highly recommend making an appointment with our experienced doctor. Feedback from our patients suggests this really helps them in making the right decision about the potential treatment. We Offer NO Obligation Consultations. To contact us please call (03) 9300 1244 or send us an email via our contact form. Your email will be forwarded to the appropriate staff member to respond. Treatment with Gemini Laser will most likely cause short-term redness/swelling. Following each treatment, further reduction mall red and blue vessels will result. To maximise the the desired result being achieved and reduce any post treatment side-effects it is important your medical and tanning history is discussed with your treating doctor. Furthermore, if there are any changes in your medical and/or tanning history, please ensure these are discussed prior to subsequent treatments.